So i have just installed a boost controller onto my b230fk (13c) and can't get above 0.6 bar. I have installed the device correctly by my knowledge. Fully turned down the boost cauge gives me a 0.2 ish reading. But no mather how much i unscrew the controller above 0.6 it wont go. Now because is can control it below 0.6 bar i think the device is applied correctly. My knowledge about turbo engines is inssufficient to know where to look for this problem. One of my friends suggested a leak somewhere but i just dont know. Hope someone has an explanation. What type/brand boost controller? and a leak in the hoses feeding it will be a serious problem with building boost. Met een beetje pech is de wastegate helemaal weggesmolten in het turbinehuis.. gebeurd helaas wel vaker. Eerst even kijken of je wel voorspanning hebt op de wastegate actuator. With a bit of bad luck the wastegate is completely melted away in the turbine house .. unfortunately happened more often. First check whether you have a pre-tension on the wastegate actuator. Pretty sure the wastegate isn't melted away. If you were making stock boost levels before the boost controller install the pre tension is probably fine. If it's a ball and spring type mbc, like mine, you should be screwing it in to build more boost. A cracked/melted turbine housing is very likely. Pull the down pipe and inspect. Even with my wastegate hose disconnected my 13c would only make about the same- melted/cracked housing was the prob. It's very common. Leaking hoses to the controller or wastegate will result in higher boost than expected, not lower. No boost to open the actuator, actuator stays closed, boost builds. I'd check actuator setup, make sure the pretension is correct first. Follow that up with CHECK FOR BOOST LEAKS. Cracked intercooler, leaking hose or coupler, both not uncommon. Cracked or melted turbine housings aren't uncommon on these cars either. Are you running a late low pressure TD04-13c? IIRC B230FK is low pressure turbo. This turbo uses a lower rated (perhaps 4 PSI) boost actuator. A bleed valve...you would "unscrew" to bleed off more pressure from the hose going to the wastegate actuator, thus opening the actuator less than if it had the unmodified pressure signal. 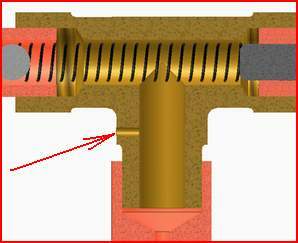 A ball & spring valve...you would "screw" tighter to give more resistance against the pressure moving the ball bearing and allowing the pressurized air to reach the wastegate actuator to open the wastegate. Check that all clamps are tight on the hoses. Check that none of the hoses are split or torn. You may need to remove the hoses to inspect them closely. I recently had a hose split near the battery and I couldn't see the hole, but I started noticing some oil film on the inner fender where previously it had been totally dry. The wastegate actuator may be weak and not able to hold closed when pressure builds in the turbine housing. You could try adding some preload to the actuator if it's adjustable. Does it have a vent to prevent residual pressure from holding the wastegate open? Disconnect the wastegate hose and go for a drive and see what happens. If it still doesn'tover boost, you could wire the wastegate flap shut and try again. I am still voting damaged turbine housing. It's also worth pulling the CBV and making sure the diaphragm isn't torn. I'd guess either housing, cracked plumbing or IC. Plumbing leaks would likely cause stumble going into boost. I have 20 quid on busted turbine housing! Lately I had the same problem. It went to 0,8 and not any further. Problem: broken pipe from idle controlvslve to intake manifold.